There are many benefits to keeping your home air ducts clean. Breathing clean air is healthy and clean air also increases the life of your HVAC system. There have been steady increases in people suffering from respiratory illnesses. By getting the ducts of your HVAC systems cleaned you are taking an important preventive measure. Our team of skilled professionals at Superior Cleaning and Restoration Inc. can help you with the sanitization and agitation of your air ducts with our cleaning units that use the Roto-Brush technique. We can vacuum the entire system clean in no time. Darkness and damp corners in the air conditioning ducts make it most conducive for mold, bacteria and mildew. Dirty air ducts can spread allergens throughout the house. With a dirty filter, the ventilation of the house remains poor, as the fresh air from outside is not able to circulate inside, leading to the spread of bacteria and disease. The cleaning of air ducts is not the one stop solution for combatting respiratory illnesses like asthma, it does however represent a major step in the treatment and prevention of disease. The fact is if you clean your HVAC system, you will most certainly rid yourself of allergens like dust, pollen and mold. Not only will the cleaning help you in ridding yourself of such allergens but it will also help you to prolong the life of your HVAC system. It is recommended that one should clean the air ducts of their residence or business no less than once a year. 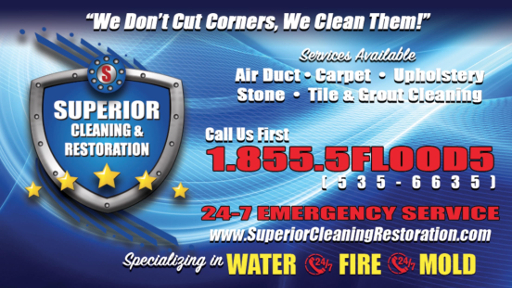 Let Superior Cleaning and Restoration Inc. make sure that your air ducts are clean and dust free .